Painting a kid's room or maybe a sidewalk cafè? Add a blackboard to your plans with new Resene Blackboard Paint and you'll have a very handy extra feature for a very minimal cost. Resene Blackboard Paint is a premium scrubbable 100% acrylic coating for all types of interior and exterior smooth surfaces where a hardwearing blackboard coating is required. It is easy to apply - prepare and prime the surface as per normal and then apply two coats of Resene Blackboard Paint by brush, roller or spray. 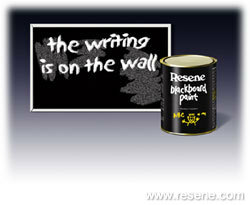 Resene Blackboard Paint is available in a 500ml can, so you only have to buy a small amount to add something a little different. In fact the hardest part is keeping would-be chalk artists away long enough to give the paint time to dry before they start covering it up with chalk!